You probably spend the best part of your life looking at the haunted fish tank after a busy day at work. Besides the usual offerings on RTE and Sky, your state-of-the-art flat screen television is where you catch up on missed programmes or watch Netflix. Since John Logie Baird invented the television set, TV units have become part and parcel of the front room for years. Today’s television sets are typically 52” wide with a very flat screen. Sometimes curved with 4K high definition picture quality and built-in surround sound. With today’s sets being of lightweight construction, you could put the set on a coffee table or a shelf. Or mount it to the wall. Great for watching the odd episode of your favourite soaps or the football. 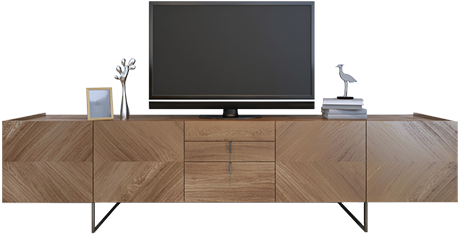 If your living room is an entertainment centre, why not consider a unit for your television set? Our TV units not only accommodate your Ultra HD set. They can accommodate games consoles, control pads and software. Also decoders and receivers for satellite, cable or digital terrestrial television channels. If you’re partial to the odd bit of retro gaming or dusting down the VHS video recorder, enough space for the VCR or console. Plus the tapes and cartridges. As no two households’ entertainment needs are the same, our TV units are made to measure. Not only for the living room. Also the bedroom, study, conservatory or games room. We offer a range of styles in a different variety of wood. Whether your taste in furniture is traditional or ultra-modern, Steven Cleary Carpentry shall put you in the picture. What’s more, our bespoke TV units are built to last. Our designs are timeless and, unlike your television set, less likely to go obsolete after two years. The technological pace of today’s tellies have risen dramatically. Standard digital pictures look long in the tooth compared with HD, 3D, Dolby Atmos and Ultra HD systems. For a free no-obligation quote, why not give us a call on 046 9028374 (landline) or 086 2448792 (mobile)? Alternatively, send us an email to clearycarpentry@gmail.com. We will get back to you as soon as possible. Steven Cleary Carpentry, 13 January 2017.